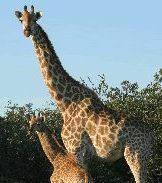 Relax at our hide overlooking the waterhole: if the locals dont get there first! 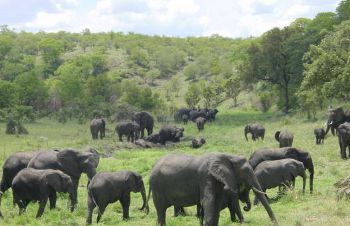 Mahlathini Reserve includes Leopard, Jackal, Giraffe, Buffallo, Wildabeest, Water buck and regular visitors include elephant, lion and wild dog. Check out the reserve managers monthly newsletters to see who is on site . See how many of our 200+ resident & migratory species of birds you can spot! Get into a good book while relaxing around the pool. The pool being only 60m from either of the two water holes you will not get much more up close and personal with Africa's wildlife than this!! Either take a guided all day, Morning, Sunset and Night Game Drives into Kruger National Park or explore the park yourself on a self drive basis. Game walks: for a unique, up close and personal experience with the wildlife. Play our local championship golf course- just watch out for the locals! Flights @ 5:30am followed by a champagne breakfast. 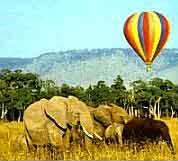 Elephant back safaris- now there is something to try!!!! We can book these activities for you. A must if you intend visiting during peak times. Dont forget the many historic sites in and around Phalabowra.